"Chapter one begins 'Face it — We’re Entertainers'. How refreshing! If today's novelists listened to Tom Sawyer, they'd have more readers, and better zip codes." Written in clear, concise language by a highly successful professional novelist/playwright/screen-and-TV writer – and teacher – this THEORY-FREE book offers practical techniques for constructing a compelling story, developing rich characters and extraordinary dialogue. 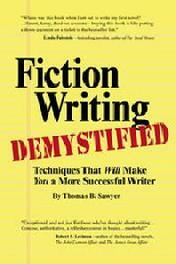 Simply put, there is no other book on writing quite like FICTION WRITING DEMYSTIFIED. Via lively, entertaining examples, Sawyer demonstrates that the same methods he learned and used in the high-pressure world of writing for film and series television can be applied to – and improve – storytelling of any kind, from poetry, short stories and novels to non-fiction, stage plays, movie scripts, and even sermons. In FICTION WRITING DEMYSTIFIED, you'll find hundreds of no-nonsense, take-'em-to-the-bank nuggets that eliminate the mystery from such challenges as plotting, scene structure, building action sequences, finding conflict, avoiding clichés, and more. Also covered are problem-solving strategies for polishing the final product, all of it aimed at forcing one's readers to turn those pages – at the challenge of keeping your audience glued until The End. "Where was this book when I set out to write my first novel? Tom Sawyer translates his successful career as a screenwriter and novelist into a brilliantly practical primer that tells you all you need to know about every aspect of storytelling. Smart, funny, dead-on accurate – buying this book is like putting a down-payment on a ticket to the bestseller list." "Absolutely devoured your book! Pages folded back, underlinings, margin notes... A treasure trove, brother. Fabulous." "The best technique book I've seen. A here's-how-you-do-it book…fun…reads like a workshop, with Tom rolling breathlessly and enthusiastically from topic to topic. I began using it the day I got it." "Really wonderful…the most specific and helpful I’ve ever read – not only for the beginner but for the experienced writer…"
"Exceptional, and not just for those who’ve thought about writing a novel…Concise, authoritative, a refresher course in basics…masterful!" "Sawyer’s analysis of the craft and observations on the process are not only true, they’re universal. If you use only half of what’s in this book, your writing will be twice as good!" FICTION WRITING DEMYSTIFIED is available at your favorite bookstore, or order online in print or ebook at www.amazon.com, www.bn.com or direct from the publisher at www.ashleywilde.com. And, as an Audiobook! You can order and/or hear a sample of Jeffrey Thibeault’s wonderful narration at FictionWritingDemystified. Just click below the book-cover.